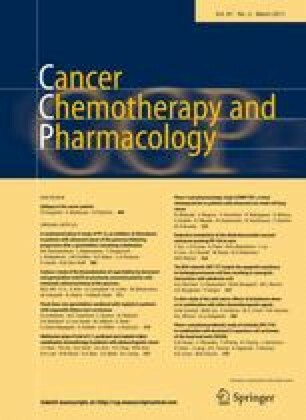 This study evaluated PX-12, a novel small molecule inhibitor of the proto-oncogene (Trx-1), in patients with previously treated advanced pancreatic cancer (APC). PX-12 (54 or 128 mg/m2) was administered by 3-hour IV infusion daily ×5 days every 21 days (n = 17). Patients were randomized to either 54 or 128 mg/m2 and then stratified based on CA 19-9 level (≥1,000 vs. <1,000 U/ml) and SUV values on PET scans (≥7.0 vs. <7.0). The primary endpoint was based on a progression-free survival (PFS) at 4 months in ≥40% of patients, and required 40 patients in each arm. An amendment required elevated Trx-1 levels (>18 ng/ml) as an entry criteria after the first 17 patients were accrued. Plasma Trx-1 levels were elevated in 3/28 (11%) patients screened for study. The grade of the expired metabolite odor was higher in the 128 mg/m2 arm. Therapy was well tolerated, and Grade ≥3 adverse events were uncommon. The best response was stable disease in 2 patients. There was no consistent decrease in SUV, Trx-1 levels or CA 19-9 levels with therapy. No patients had a PFS of >4 months. Median PFS and survival were 0.9 months (95% CI 0.5–1.2) and 3.2 months (95% CI 2.4–4.2), respectively. Due to the lack of significant antitumor activity and unexpectedly low baseline Trx-1 levels, the study was terminated early. PX-12 does not appear to be active in unselected patients with previously treated APC. The authors thank Nina Cantafio for editorial assistance. Dr. Sylvan Green (deceased) for statistical assistance in designing this study. Alton Hiscox, Michael Boice at Prolx Pharmaceuticals for ELISA analysis. Michele Avery for secretarial analysis. Supported in part by grants from NCI: P01 CA109552, R44CA075923 and ProlX Pharmaceuticals. Study identifier: NCT00177242.